Should Your Horse Have a Sweet Tooth? 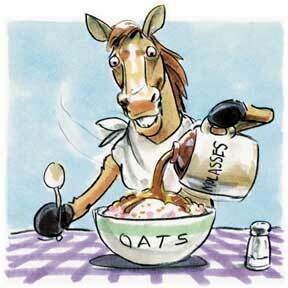 If your horse loves sweets, then you know why it is eagerly accepting any feed that contains molasses. While used to decrease the dust generated by oats and other grains, molasses also adds the kind of taste that horses love. Yet more and more horse owners are protesting the use of molasses and allege that it is the culprit behind colic, hyperactivity, founder, diabetes, and even Equine Cushing’s disease (hyperadrenalcorticism). content to about 40 percent, you will quickly realize that there is far less sugar in the offending molasses than was first believed. Additionally, the horse feed really only uses about 10 percent of molasses, and with a few short clicks on the calculator you will be able to calculate that the actual amount of sugar your horse may be exposed to per pound of feed is about four percent. Compare this figure to the 12 percent sugar usually contained in alfalfa hay, and it becomes quite apparent that the molasses added to the feed does not really add that much sugar to the horse’s daily intake. Yet what is the cause for the aforementioned ailments and behavior problems experienced by horses and horse owners? One possible explanation may lay in the fact that the horse is ingesting too many calories while not receiving sufficient exercise to burn off the extra energy. Hyperactivity has also been blamed on the fact feed is supplemented with more grain than hay, thus adding extreme capacity to the amount of energy the horse is taking in. As a horse owner, you will be able to quickly and concisely correct your horse’s energy intake by supplying a feed with an elevated fat content. Thus, the density of the consumed energy will be higher, whereas the amount of feed required will be lowered. This will permit you to decrease the amount of grain fed, resulting in a possible prevention of hyperactivity as well as reduced blood glucose levels and therefore lesser chances of diabetes. Keep in mind, however, that raising the percentage of fat too dramatically will lead to an actual elevation of blood glucose! For those who are still not quite convinced about the molasses in their horse’s feed, consider the calculation of non-structural carbohydrates (NSC) that are contained in the feed. Behind the moniker hide the kinds of carbs that are made up of starches and sugars that are being digested in the horse’s gut via enzymatic actions. Scientists have discovered that timothy hay contains the lowest levels of NSC. Furthermore, those horse feeds that are rich in fiber as well as fat will have a lower NSC number than those that lack fat and fiber. Of course, if your horse is susceptible to colic and also founder, or if your horse did receive the diagnosis of Equine Cushing’s disease, you will want to pay special attention to the ingredient listing of the feed and search for the kind of feed that offers a low level of NSC. In addition to the foregoing, you will want to offer high quality grass hay to your animal to further decrease the NSC levels in the animal’s diet. Read the next horse nutrition article on Protein Amount and Balance.